1. Creation of trash guilds to farm off them. * 500 wild monster battles, perhaps even 1000, would sure scare off newbies from doing this. * BUT how to prevent old timers with several years old alts from cheating? Only with advanced security? Anti-proxy? 2. Currently already there are many weak guilds which experienced guilds currently proudly farm. * Give Guild Leaders option to toggle if guild is participating in guild wars or not. This option should be OFF by DEFAULT. 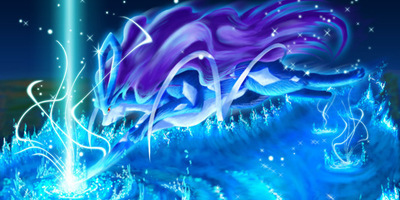 * Like in ELO, if you have high score and you're attacking a weakling, you'll get 0 points for victory, there should also be a evaluation mechanism between attacker and defender in Guild Wars: if attacker's account has better arsenal for attacking than defender's account, then attacker shouldn't be rewarded for picking on weaklings. (2017-06-22, 08:25 PM)Mysterium Wrote: * Give Guild Leaders option to toggle if guild is participating in guild wars or not. This option should be OFF by DEFAULT. If 1 player in a guild has an alt that's in another guild, e.g. I, from LOLzz, have a spare in Lazyz guild, LOLzz may not attack Lazyz. Therefore preventing any member from a guild, to have an alt account in another guild and attack it. It at least, hopefully, will cut down major abuse. Those who want to be topped rank will have to battle the top ranked guilds, to lower the opponent guilds score aswell as raise their own. So if we don't log out, then AI won't take over fully and defender will lose? Could you in that case make an AFK checker? For e.g. if player hasn't done any operations in ppets in 4 minutes, then let AI fully control defense. Otherwise it is very unfair. Btw, if 2 players are attacking at the same time and win against a defender who has only 1 defense point remaining, will defender lose 2 points or only 1? I'm for whichever idea can be implemented. Also, I wish each guild had a feature to mark a member out of guild wars, so we could keep all friends without harming guild's position. how can others get free reward by slacking? (2017-06-24, 06:34 AM)Mysterium Wrote: So if we don't log out, then AI won't take over fully and defender will lose? Such weird bugs going on. Our guild had 30 defense points. I attacked twice, won both. Our defense dropped to 29. I checked log, none of our members lost. So, after few minutes enemy attacked our member, lost, BUT our defense still dropped down to 28... What is this? Enemy attacked second time, lost again. Alright our defense points remained. Or was it a delayed bug from first attack? E.g. : attacked twice, lost twice, but WE lost 2 defense points? I also noticed that opposing guild's Attack Chance didn't lower at all after their attacks. Why is it that when there are 2 guilds, with the exact same points, one gets ranked higher then the other? I find it highly unfair when the 2 guilds on top get ranked like that..
(2017-06-26, 01:12 AM)sea2003main Wrote: Why is it that when there are 2 guilds, with the exact same points, one gets ranked higher then the other? If you do not beat their score, it is not a win, so they retain their position. It's like Guinness world record - if you make same numbers, you will not be rewarded, but if you beat the record, you'll be the new record holder. Only participating players should get reward. And players who get excluded from gw they know why they are out: busy school/work, no time to play, using ppets for chatting only etc. i agree. 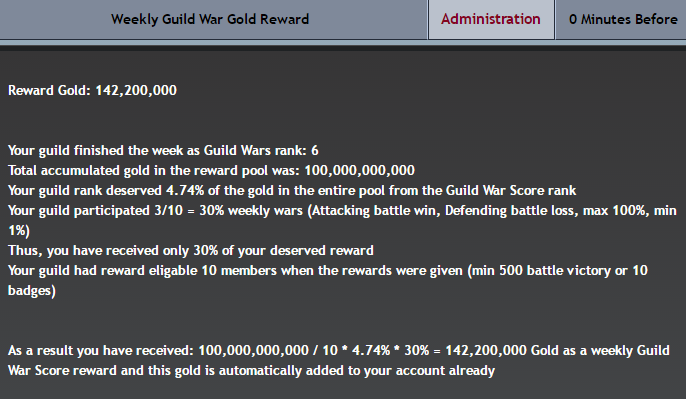 only players who participate in guild war should get the reward. you can transfer the reward to guild bank and then the leader should be able to select the players who should get the reward and then the reward will be equally distributed among all the selected players. would be good because some players don't participate in war or can't make it on time. Well if we can't have disable, can we do some guild wing? Divide guild in 2 section: 1st war, 2nd wing. And rewards only get divided between wars one. Or better all gold to go in clan bank . Leader can send that golds to players equally.